There is a widespread opinion among many Franciscan seculars and religious that the Profession of Secular Franciscans is a “second class” commitment, some kind of a “light” Profession. Indeed, most people have foggy ideas on the value of Profession in the Secular Franciscan Order and because of this many Secular Franciscans do not live the “grace” of Profession for what it really is: A true nuptial alliance with Jesus Christ aimed at a further consecration to God and at accomplishing a closer bond to the Church to reach the perfection of love and the realization of Saint Francis mission. Profession in the SFO – Gift and Commitment by Cangelosi, OPM (click to open) will open the eyes to many candidates in formation as well as to many formators and professed members of the SFO in general and will undoubtedly give a new outlook to many Secular Franciscans on what they are, or ought to be, as Professed members of the SFO and on how to live their Franciscan vocation and mission. 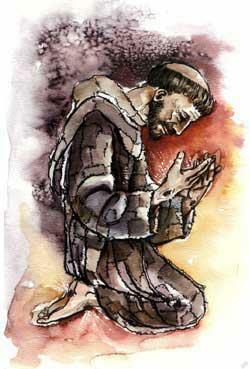 This is a profound document and a must read for all Secular Franciscans. Ritual of SFO – Click and go to chapter 2 for profession ritual.